RIP yellow walls (2012-2015). My room got a complete makeover a few weeks ago and while I was absent from my blog/YouTube, I was Snapchatting the whole thing. My paint covered hair got documented, and so did my really sweaty face because it was really hot outside. Redoing my room wasn't easy whatsoever but I'm so happy with how my room turned out. You'll be seeing a formal room tour later on this month but you can see snippets of how it currently looks like in this vlog. 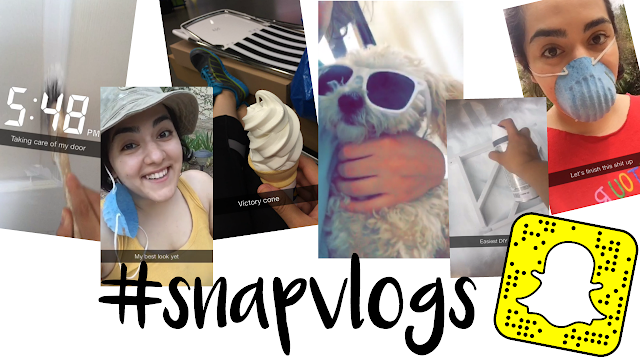 I hope you enjoy this latest #snapvlog! If you want to see my daily Snapchat stories just follow me on the app. You can input my username on the app or you take a picture of the yellow Snapcode in Snapchat (you can find my code on the left side of the video or on the thumbnail picture). When was the last time you gave your room a makeover? Let me know in the comments below. PS. Don't buy paint with primer!